How can you tell if a hedgehog is hibernating? This is a question I am frequently asked by my foster carers, a network of special people who support me with looking after rehabilitated hedgehogs over the Winter period. These hedgehogs missed the deadline for release before the weather turned cold and, if they are well enough and heavy enough (absolute minimum of 650g), they will be allowed to hibernate in captivity. Hibernation is not like sleeping. The hedgehog won’t be roused by touch or by noise. Hibernation is a state of torpor, where the core body temperature has dropped, the heart rate and breathing have slowed right down and normal activity has stopped. A hibernating hedgehog will be completely rolled up into a tight ball with no face visible. You can tell that the hedgehog is hibernating and not dead by the fact that it will ‘ripple’ when touched very gently. It may also emit a little ‘snore’! Hedgehogs also generally don’t die curled up…. Please don’t read this post and think you should go around disturbing the hibernating wild hedgehogs in your garden to check on them. I only check on these hedgehogs during hibernation because they have been poorly. Weight checks every few weeks will alert me to any potential problems and they can be woken up again if they have lost too much weight. I use a special calculator from a wildlife rescue to assess whether their weight loss in hibernation is acceptable or not. Waking up a hibernating hedgehog is also a specialist task, so please do not try this yourself. You will kill the hedgehog if you try to warm it up quickly. It can take several days. The best advice is not to disturb a hedgehog in hibernation. Take care when gardening in Winter. Don’t be tempted to tidy up piles of leaves or logs – they may be home to a hibernating hedgehog. If you do accidentally disturb one, cover it back up straight away – unless there is a chance that you have caused injury e.g. with a fork. In that case, you must take it straight to a hedgehog rescue. If you disturb a hedgehog that has hibernated in a completely unsuitable spot – such as inside a garage that is normally left closed – then you will need to very carefully relocate the hedgehog. You should move it to inside a wooden hedgehog house filled with plenty of hay. You will need to site it properly to give the hedgehog a good chance. It takes a long time for a hedgehog to waken from hibernation so it will likely stay curled up whilst you relocate it. Don’t relocate it to a completely new area – hedgehogs know all the best places for nesting and food in their area. You will seriously disadvantage a hedgehog by relocating it to a completely different area. Hibernation is also not a continuous state. Hedgehogs will wake up during periods of milder weather for a quick snack or sometimes even to move their hibernaculum if the warmer spell lasts for a few days. I always leave out a bowl of water in the garden and a little food year round to help hedgehogs that have briefly woken from hibernation. With a little luck, hedgehogs that were healthy when they hibernated will wake in the Spring. The exact timing depends upon the temperature and can be as early as March or as late as May. They will emerge hungry so Spring is a great time to put out hedgehog feeders and make sure that you can give them a hearty breakfast when they emerge…. The start of hibernation also varies each year and around the country. It tends to be triggered by consistent low night time temperatures but there can be considerable variation in these temperatures even between country and urban areas that are quite close together and even between individual gardens in the same city. Some hedgehogs may start hibernating as early as October, whereas it may be much later in a milder Autumn or for mums that may have had a late litter of babies. Hedgehogs might not hibernate at all if there is a good food source and a warm microclimate. Don’t worry, this won’t hurt them. I run a hedgehog rescue in York, England. My hospital is entirely self-funded. You can find out more about me and my work here and also how to support my work. 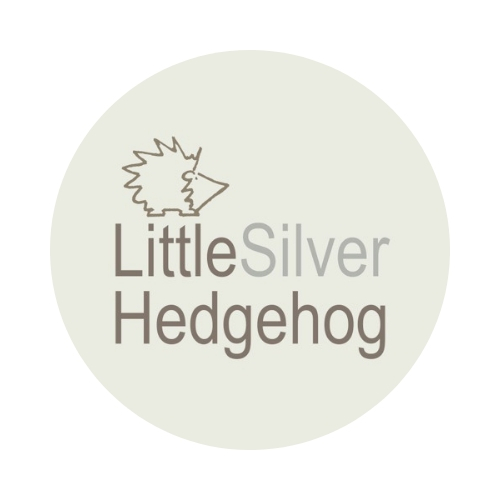 I make silver jewellery inspired by nature and wildlife to raise funds for my hedgehog hospital. You can visit my online jewellery shop here. A hedgehog ran past me last night heading for the food I leave every night! So pleased that you feed them! This warm spell means many have woken up from hibernation! They haven’t had much sleep at all this winter! My wild ones have – less so the rehabilitated ones but I know some haven’t hibernated at all elsewhere! The ones here seem to have been about most of the winter. Worrying as it is unusual, but they seem fat and frisky. And I put food out every night. he came out into the cage to lye on top of the towel and his back legs are spread outwards straiight, i will keep checking on him at mo. Oh goodness, how is it doing? Sounds like it is very poorly….